"This a delicious way to use up all that summer squash! I will often make this recipe on Sunday and then have an easy, nutritious lunch ready for the week." Heat butter and olive oil in a large skillet over medium heat. Add onion and garlic; cook and stir until onion is soft but not browned, about 5 minutes. Scoop flesh from the zucchini halves using a spoon, leaving a 1/4-inch layer intact. Chop zucchini flesh and stir into the skillet. Cook until soft, 3 to 5 minutes. Stir in bread crumbs, parsley, salt, and pepper. Reduce heat to low. Flake crabmeat into the skillet, leaving some larger chunks. Add lemon juice and ground mustard. Cook until crabmeat is heated through, 2 to 3 minutes. Remove from heat. Divide crabmeat mixture evenly among the zucchini halves. Sprinkle Parmesan cheese on top. 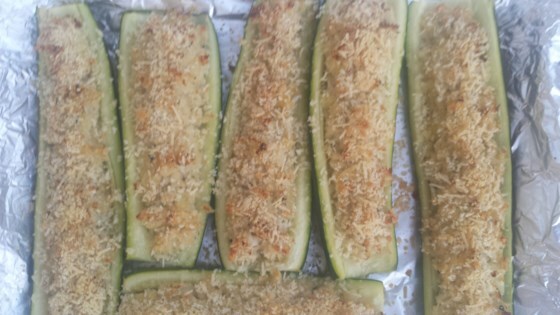 Bake in the preheated oven until zucchini is soft, 20 to 30 minutes.